Fish Head seemed to pop up out of the blue. I hadn’t heard anything about it until someone told me after it had opened. It’s another venture from Walter Ventura and it’s in the same location as another one of his restaurants, British India in Morphett Street. Out with the old, in with the new it seems and I think it’s a welcome change, capitalising on the current popularity of south east Asian food. Fish Head’s food is a blend of Malay, Indonesian and a hint of Indian and it’s always comforting to know that chef Nu Suandokmai is behind the food. Nu has an excellent track record that includes Asian greats such as Nu Thai, Golden Boy, Cliché Exhibition and Gin Long Canteen. He’s joined in the kitchen by Rakesh Chandra who’s stayed on from British India and Kenneth Ting from Concubine. The fit out’s pretty simple with wooden chairs, copper covered tables and dim lighting, and I love the feature fish art on the wall. The staff are all friendly and likeable, some of whom have stayed on from British India including the manager. 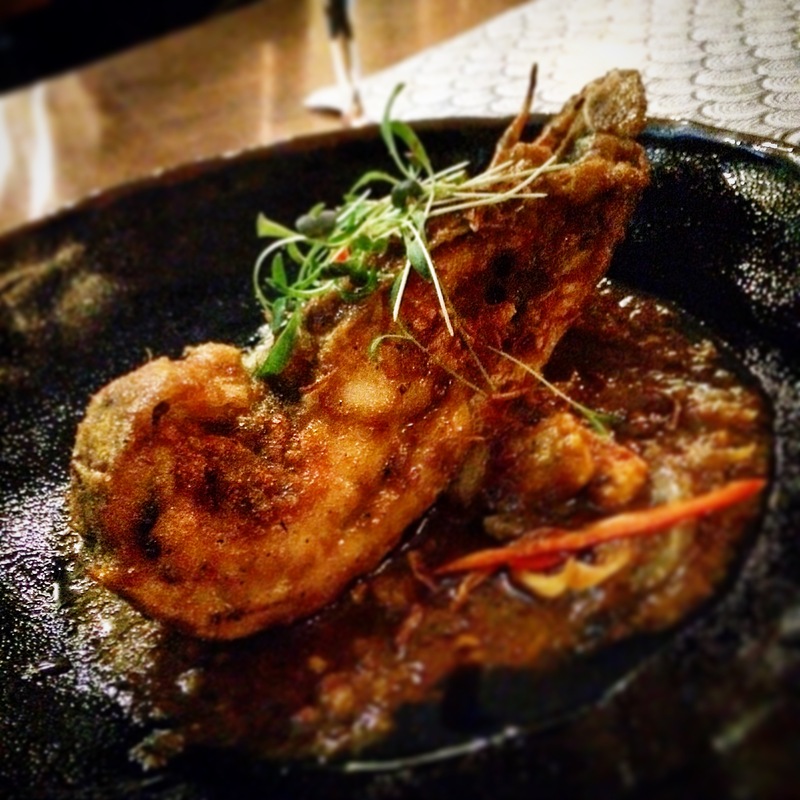 The menu reads really well with dishes categorised into Hawker, Luxe and Sides. Hawker food always excites me and we ordered the Spicy lamb ribs, the Street beef naan and the Bug tails. The Spicy lamb ribs – twice cooked master stock spicy rib, dry chilli and kaffir sambal were good. Yes, a little fatty as you’d expect a lamb rib to be, but plenty of meat too and good flavours. The Street beef naan was excellent. It was grilled tenderloin with tamarind, smoked chilli chutney, coriander and spring onion. The meat was quite sweet and the smokiness and the crunch of shallots combined well with the freshness of the coriander and spring onion. The Bug tails dish was really only a half a bug tail, pan fried in a seafood spice paste with baby corn and spring onion. Quite a spicy dish and the bug had a fair bit of meat. From the Luxe section of the menu we ordered the Coconut milk chilli turmeric braised beef cheek with apple, Thai eggplant, coconut and curry leaves. I really liked this dish. Really tender beef and the coconut on top really brought a freshness to the dish. Our other main was the Leather Jacket fish with dry galangal, chilli, garlic sambal, papaya and tomato salad. I had leather jacket a lot growing up and it’s one of my favourites. When the dish arrived I was a little disappointed at how small the fish were, but there was still enough meat for the two of us and it was a good dish. We accompanied our mains with the KangKong with sambal and a serve of yellow rice. As full as we were, we managed to finish a complimentary serve of the Pandan coconut layered crepes with vanilla ice cream and I have to say, it really rounded out the meal. We were quite thankful. I’ll definitely be dining at Fish Head again – there are lots of other dishes I’d like to try. I wouldn’t have minded trying the fish head curry, but my partner’s not a fish head kinda guy. The food tends to be a little on the sweet side, but some people like it like that, but apart from that it’s tasty, fragrant and quite spicy. If you’re not a fan of spicy, I’d stay away. Just be wary of ordering too many sambal-style dishes as you don’t want them all to taste similar. My only minor complaint would be that there were too many different wait staff tending to our table, but as I mentioned, they were all great people so it wasn’t really too much of an issue.